We’d love your help. Let us know what’s wrong with this preview of Love My Shoes! by Eileen Spinelli. From book cover: Sneakers, flip-flops, fuzzy slippers - so many shoes to wear and adore! Love My Shoes! celebrates the endless fun you can have dressing your feet to work, play, and even dance your socks off. 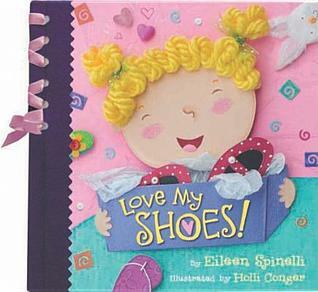 This lively book will be a shoe-in with feet big and small. To ask other readers questions about Love My Shoes!, please sign up. Be the first to ask a question about Love My Shoes! Eileen Spinelli, wife of famed children's author Jerry Spinelli, is an award winning children's book author from southeastern Pennsylvania. Trivia About Love My Shoes!